In writing a few days ago about "Word Attraction" — the irrational exuberance that particular words sometimes inspire — I failed to note the possibility that emotion might be associated with the pronunciation of particular words by particular people. This morning, I'll try to track down a specific example that I've wondered about for some time. 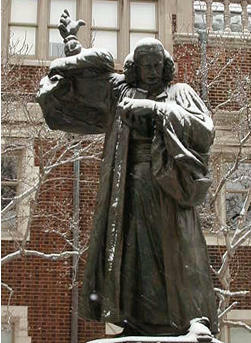 Whitefield was a much-traveled evangelical preacher, one of the leaders of the Great Awakening, who played an indirect part in the beginnings of the University of Pennsylvania. In implementing his 1749 Proposals for the Education of Youth in Pensilvania, Benjamin Franklin made use of a partly finished "New Building" that had been put up in 1740 to give Whitefield a place to preach. Whitefield's published sermons seem rather ordinary — the printed texts don't convey, at least to me, what Benjamin Franklin called "the extraordinary influence of his oratory". Specifically, I recall reading somewhere that Whitefield could make audience-members faint merely by saying the word 'Mesopotamia'; and so today I thought I'd try to track down this story to its source. It turns out, unsurprisingly, to be a mis-remembered figure of speech. Whitefield was by all accounts an extraordinary speaker; but there was probably not really any special effect in his performance of any particular word. By hearing him often, I came to distinguish easily between sermons newly compos'd, and those which he had often preach'd in the course of his travels. His delivery of the latter was so improv'd by frequent repetitions that every accent, every emphasis, every modulation of voice, was so perfectly well turn'd and well plac'd, that, without being interested in the subject, one could not help being pleas'd with the discourse; a pleasure of much the same kind with that receiv'd from an excellent piece of musick. This is an advantage itinerant preachers have over those who are stationary, as the latter can not well improve their delivery of a sermon by so many rehearsals. Garrick was a great admirer of Whitefield's eloquence, and frequently attended his ministry. He heard him with great delight, and, like Franklin, distinguished between his new and his old sermons, saying that his eloquence advanced up to its fortieth repetition before it reached his full height, and that Whitefield could make his audiences weep or tremble merely by varying his pronunciation of the word Mesopotamia. Garrick once said, "I would give a hundred guineas if I could only say 'O!' like Mr. Whitefield." [Whitefield] is truly a remarkable man, and during his visit has, I think, verified all that we have heard of him. He makes less of the doctrines than our American preachers generally do, and aims more at affecting the heart. He is a born orator. You have already heard of his deep-toned, yet clear and melodious voice. O it is perfect music to listen to that alone. And he speaks so easily, without any apparent effort. You remember that David Hume thought it was worth going twenty miles to hear him speak; and Garrick said, 'He could move men to tears or make them tremble by his simple intonations in pronuncing the word Mesopotamia.' Well, this last was a mere speech of the play-actor; but it is truly wonderful to see what a spell this preacher often casts over an audience by proclaiming the simplest truths of the Bible. I have seen upward of a thousand people hang on his words with breathless silence, broken only by an occasional half-suppressed sob. Garrick, so it is affirmed, used to say that Whitefield could make people weep merely by his enunciation of the word Mesopotamia, or by the pathos with which he could read a bookseller's catalogue! Garrick did not say he had ever seen this feat performed; he surely must have been befooling some too warm admirer of the preacher, to see how much he could believe. Here is the rest of the passage on Whitefield in Benjamin Franklin's Autobiography. In 1739 arrived among us from Ireland the Reverend Mr. Whitefield, who had made himself remarkable there as an itinerant preacher. He was at first permitted to preach in some of our churches; but the clergy, taking a dislike to him, soon refus'd him their pulpits, and he was oblig'd to preach in the fields. The multitudes of all sects and denominations that attended his sermons were enormous, and it was matter of speculation to me, who was one of the number, to observe the extraordinary influence of his oratory on his hearers, and how much they admir'd and respected him, notwithstanding his common abuse of them, by assuring them that they were naturally half beasts and half devils. It was wonderful to see the change soon made in the manners of our inhabitants. From being thoughtless or indifferent about religion, it seem'd as if all the world were growing religious, so that one could not walk thro' the town in an evening without hearing psalms sung in different families of every street. And it being found inconvenient to assemble in the open air, subject to its inclemencies, the building of a house to meet in was no sooner propos'd, and persons appointed to receive contributions, but sufficient sums were soon receiv'd to procure the ground and erect the building, which was one hundred feet long and seventy broad, about the size of Westminster Hall; and the work was carried on with such spirit as to be finished in a much shorter time than could have been expected. Both house and ground were vested in trustees, expressly for the use of any preacher of any religious persuasion who might desire to say something to the people at Philadelphia; the design in building not being to accommodate any particular sect, but the inhabitants in general; so that even if the Mufti of Constantinople were to send a missionary to preach Mohammedanism to us, he would find a pulpit at his service. Mr. Whitefield, in leaving us, went preaching all the way thro' the colonies to Georgia. The settlement of that province had lately been begun, but, instead of being made with hardy, industrious husbandmen, accustomed to labor, the only people fit for such an enterprise, it was with families of broken shop-keepers and other insolvent debtors, many of indolent and idle habits, taken out of the jails, who, being set down in the woods, unqualified for clearing land, and unable to endure the hardships of a new settlement, perished in numbers, leaving many helpless children unprovided for. The sight of their miserable situation inspir'd the benevolent heart of Mr. Whitefield with the idea of building an Orphan House there, in which they might be supported and educated. Returning northward, he preach'd up this charity, and made large collections, for his eloquence had a wonderful power over the hearts and purses of his hearers, of which I myself was an instance. I did not disapprove of the design, but, as Georgia was then destitute of materials and workmen, and it was proposed to send them from Philadelphia at a great expense, I thought it would have been better to have built the house here, and brought the children to it. This I advis'd; but he was resolute in his first project, rejected my counsel, and I therefore refus'd to contribute. I happened soon after to attend one of his sermons, in the course of which I perceived he intended to finish with a collection, and I silently resolved he should get nothing from me, I had in my pocket a handful of copper money, three or four silver dollars, and five pistoles in gold. As he proceeded I began to soften, and concluded to give the coppers. Another stroke of his oratory made me asham'd of that, and determin'd me to give the silver; and he finish'd so admirably, that I empty'd my pocket wholly into the collector's dish, gold and all. At this sermon there was also one of our club, who, being of my sentiments respecting the building in Georgia, and suspecting a collection might be intended, had, by precaution, emptied his pockets before he came from home. Towards the conclusion of the discourse, however, he felt a strong desire to give, and apply'd to a neighbour, who stood near him, to borrow some money for the purpose. The application was unfortunately [made] to perhaps the only man in the company who had the firmness not to be affected by the preacher. His answer was, "At any other time, Friend Hopkinson, I would lend to thee freely; but not now, for thee seems to be out of thy right senses." Some of Mr. Whitefield's enemies affected to suppose that he would apply these collections to his own private emolument; but I who was intimately acquainted with him (being employed in printing his Sermons and Journals, etc. ), never had the least suspicion of his integrity, but am to this day decidedly of opinion that he was in all his conduct a perfectly honest man, and methinks my testimony in his favour ought to have the more weight, as we had no religious connection. He us'd, indeed, sometimes to pray for my conversion, but never had the satisfaction of believing that his prayers were heard. Ours was a mere civil friendship, sincere on both sides, and lasted to his death. The following instance will show something of the terms on which we stood. Upon one of his arrivals from England at Boston, he wrote to me that he should come soon to Philadelphia, but knew not where he could lodge when there, as he understood his old friend and host, Mr. Benezet, was removed to Germantown. My answer was, "You know my house; if you can make shift with its scanty accommodations, you will be most heartily welcome." He reply'd, that if I made that kind offer for Christ's sake, I should not miss of a reward. And I returned, "Don't let me be mistaken; it was not for Christ's sake, but for your sake." One of our common acquaintance jocosely remark'd, that, knowing it to be the custom of the saints, when they received any favour, to shift the burden of the obligation from off their own shoulders, and place it in heaven, I had contriv'd to fix it on earth. The last time I saw Mr. Whitefield was in London, when he consulted me about his Orphan House concern, and his purpose of appropriating it to the establishment of a college. He had a loud and clear voice, and articulated his words and sentences so perfectly, that he might be heard and understood at a great distance, especially as his auditories, however numerous, observ'd the most exact silence. He preach'd one evening from the top of the Court-house steps, which are in the middle of Market-street, and on the west side of Second-street, which crosses it at right angles. Both streets were fill'd with his hearers to a considerable distance. Being among the hindmost in Market-street, I had the curiosity to learn how far he could be heard, by retiring backwards down the street towards the river; and I found his voice distinct till I came near Front-street, when some noise in that street obscur'd it. Imagining then a semi-circle, of which my distance should be the radius, and that it were fill'd with auditors, to each of whom I allow'd two square feet, I computed that he might well be heard by more than thirty thousand. This reconcil'd me to the newspaper accounts of his having preach'd to twenty-five thousand people in the fields, and to the antient histories of generals haranguing whole armies, of which I had sometimes doubted. By hearing him often, I came to distinguish easily between sermons newly compos'd, and those which he had often preach'd in the course of his travels. His delivery of the latter was so improv'd by frequent repetitions that every accent, every emphasis, every modulation of voice, was so perfectly well turn'd and well plac'd, that, without being interested in the subject, one could not help being pleas'd with the discourse; a pleasure of much the same kind with that receiv'd from an excellent piece of musick. This is an advantage itinerant preachers have over those who are stationary, as the latter can not well improve their delivery of a sermon by so many rehearsals. His writing and printing from time to time gave great advantage to his enemies; unguarded expressions, and even erroneous opinions, delivered in preaching, might have been afterwards explain'd or qualifi'd by supposing others that might have accompani'd them, or they might have been deny'd; but litera scripta manet. Critics attack'd his writings violently, and with so much appearance of reason as to diminish the number of his votaries and prevent their encrease; so that I am of opinion if he had never written any thing, he would have left behind him a much more numerous and important sect, and his reputation might in that case have been still growing, even after his death, as there being nothing of his writing on which to found a censure and give him a lower character, his proselytes would be left at liberty to feign for him as great a variety of excellence as their enthusiastic admiration might wish him to have possessed. The college that Franklin mentions in passing is not Penn, but "Bethesda College" in Savannah, Georgia. The building that Franklin calls "about the size of Westminster Hall" is apparently the property that later became Penn. He preach'd one evening from the top of the Court-house steps, which are in the middle of Market-street, and on the west side of Second-street, which crosses it at right angles. Both streets were fill'd with his hearers to a considerable distance. Being among the hindmost in Market-street, I had the curiosity to learn how far he could be heard, by retiring backwards down the street towards the river; and I found his voice distinct till I came near Front-street, when some noise in that street obscur'd it. Imagining then a semi-circle, of which my distance should be the radius, and that it were fill'd with auditors, to each of whom I allow'd two square feet, I computed that he might well be heard by more than thirty thousand. For his calculation to correctly come out with the result of 30,000, he'd need to start with a distance of just 195.4 ft., which is well under half of the block-long span that he cites. Whitefield was indeed a remarkable man; Alan Taylor devotes a section of his superb history American Colonies to him, and says of him (on p. 347): "Although short, slight, and cross-eyed, Whitefield compelled attention by his fluid and dramatic movements and by a magnificent voice that he modulated like a fine instrument. The contrast between Whitefield's insignificant appearance and commanding performance encouraged the impression that God inspired his preaching. A masterful promoter, Whitefield also exploited the marketing techniques of a commercial society, employing advance men, handbills, and newspaper notices to build his celebrity and audience expectation." His 1739-41 tour from Maine to Georgia made him the first celebrity seen and heard by people throughout the colonies. However, he "evoked a relatively tepid response beyond the evangelical Calvinists. Because most Anglicans distrusted his emotional preaching and ecumenical support, Whitefield made little impact in the southern colonies, which also lacked the dense settlement and many printing presses so central to his celebrity in the north" (p. 348). His name is (or, I add cautiously, was traditionally) pronounced WHIT-field, showing the same vowel shortening as in Christmas and Michaelmas. Incidentally, you might want to fix the typo in "litera scripta monet" (should be litera scripta manet: Vox audita perit, litera scripta manet 'The heard voice perishes, the written letter remains'). Thanks for an interesting post. I recall reading somewhere that by the 18th century Philadelphia was the second-largest city in the English-speaking world. Would its population have totalled as much as 163,000 in Franklin's day? By 1790 Philadelphia was second to New York in the United States with a population of 28,522. For purposes of comparison, in 1801 the population of London was almost 1 million and the population of the greater London area exceeded 1 million. For Bill Walderman — The sizes of American cities relative to those in the British Isles in the 18th century has been overstated — no American city was nearly as big as (for instance) Dublin. The quotation, via Wakeley, from Sarah Pierpoint must be from much later than 1740, as it cites David Garrick, who saw his first play in that year, and David Hume, whose first publication was in 1739-40. "Now, the art of canting consists in skilfully adapting the voice to whatever words the spirit delivers, that each may strike the ears of the audience with its most significant cadence. The force or energy of this eloquence is not to be found, as among ancient orators, in the disposition of words to a sentence, or the turning of long periods; but, agreeably to the modern refinements in music, is taken up wholly in dwelling and dilating upon syllables and letters. Thus, it is frequent for a single vowel to draw sighs from a multitude, and for a whole assembly of saints to sob to the music of one solitary liquid." There was an cartoon in Punch with an elderly lady leaving church and saying, "What a world of comfort there is in that grand old word "Mesopotamia." The germ of a meme here, perhaps. It makes me so happy that people were confusing Monet and Manet even before they were born. I think I discern the source of Whitfield's power in the statue. It's those sleeves! With bellows like those, how could his 'O' not be mighty and his Mesopotamia invincible? This is obviously the same thing as "I'd pay to hear him read the phone book…"
Franklin's crowd estimate is perhaps partially explainable by the fact that certain portions of his semicircle were presumably taken up by buildings. I'm unfamiliar with even the present geography of Philadelphia, much less that in the eighteenth century, but as the oration occurred on the courthouse steps one would assume the area in question was rather developed. The crowd would be bunched up only in the streets., giving them likely less than half the area of the semicircle. There's one other thing that bothers me about Franklin's crowd estimate. The sound would be channeled by the buildings lining the street, so his maximum audible distance from Mr. Whitefield would probably have exceeded the same measurement in an open field. I do not doubt that there are people, and perhaps Whitefield was among them, who can be heard without amplification by a silent crowd of 25 to 30 thousand. But it is rare indeed to encounter that combination of strong voice with the eloquence. And thus remarkable. I think he might have meant "two square yards" rather than "two square feet", which would be about an order of magnitude off. And what, is Michaelmas "Micklemas"? I hasten to correct my "Michael-mass" of thirty years' standing.